Although the construction and engineering sector makes important contributions to the economic, social, and environmental objectives of a nation, it has a notorious reputation for being an unsafe industry in which to work. Despite the fact that safety performance in the industry has improved, injuries and fatalities still occur frequently. To address this, the industry needs to evolve further by integrating safety into all decision making processes. 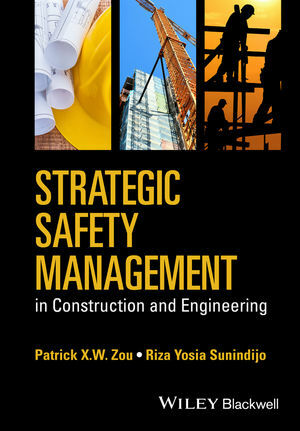 Strategic Safety Management in Construction and Engineering takes a broad view of safety from a strategic decision making and management perspective with a particular focus on the need to balance and integrate ‘science’ and ‘art’ when implementing safety management. The principles covered here include the economics of safety, safety climate and culture, skills for safety, safety training and learning, safety in design, risk management, building information modelling, and safety research methods and the research-practice nexus. They are integrated into a strategic safety management framework which comprises strategy development, implementation, and evaluation. Practical techniques are included to apply the principles in the context of the construction and engineering industry and projects. Case studies are also provided to demonstrate the localised context and applications of the principles and techniques in practice. Patrick Xiao Wei Zou is Professor and Research Leader of Construction Engineering and Management at Swinburne University of Technology, Australia. With a PhD in Civil Engineering from the University of New South Wales (UNSW), Australia, he has held a professorship at the University of Canberra and associate professorship at UNSW, and visiting academic appointments at several universities in the UK, USA, Singapore and China. Dr Zou is an award winning researcher and teacher in the fields of safety management, risk management, and sustainable building and construction systems. Prior to entering to academia he worked as construction engineer.